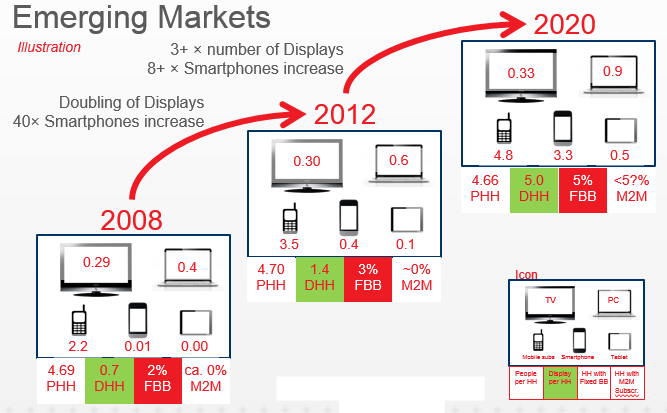 Profitability of the Mobile Business Model … The Rise! & Inevitable Fall? A Mature & Emerging Market Profitability Analysis … From Past, through Present & to the Future. I dedicate this Blog to David Haszeldine whom has been (and will remain) a true partner when it comes to discussing, thinking and challenging cost structures, corporate excesses and optimizing the Telco profitability. Opex growth & declining revenue growth is the biggest exposure to margin decline & profitability risk for emerging growth markets as well as mature mobile markets. 48 Major Mobile Market’s Revenue & Opex Growth have been analyzed over the period 2007 to 2013 (for some countries from 2003 to 2013). The results have been provided in an easy to compare overview chart. For 23 out of the 48 Mobile Markets, Opex have grown faster than Revenue and poses a substantial risk to Telco profitability in the near & long-term unless Opex will be better managed and controlled. Mobile Profitability Risk is a substantial Emerging Growth Market Problem where cost has grown much faster than the corresponding Revenues. 11 Major Emerging Growth Markets have had an Opex compounded annual growth rate between 2007 to 2013 that was higher than the Revenue Growth substantially squeezing margin and straining EBITDA. 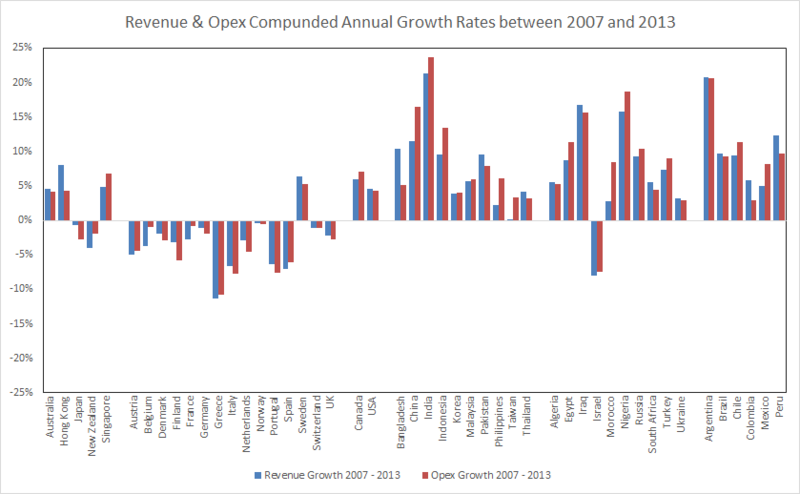 On average the compounded annual growth rate of Opex grew 2.2% faster than corresponding Revenue over the period 2007 to 2013. 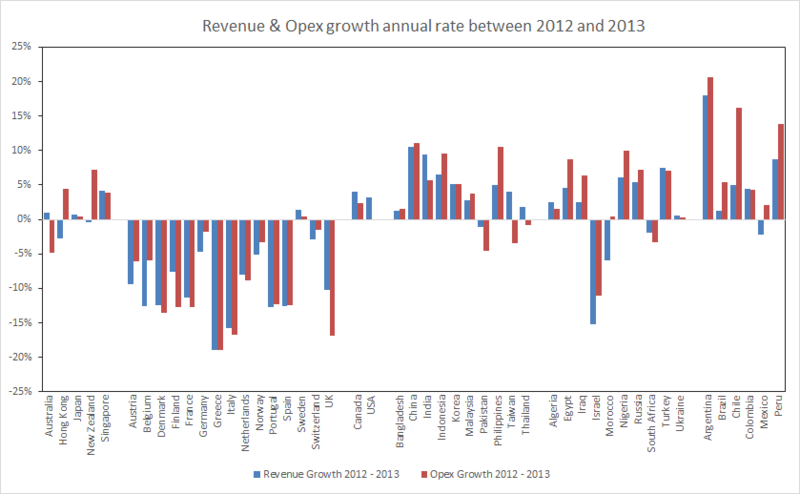 Between 2012 to 2013 Opex grew (on average) 3.7% faster than Revenue. A Market Profit Sustainability Risk Index (based on Bayesian inference) is proposed as a way to provide an overview of mobile markets profitability directions based on their Revenue and Opex growth rates. Statistical Analysis on available data shows that a Mobile Markets Opex level is driven by (1) Population, (2) Customers, (3) Penetration and (4) ARPU. The GDP & Surface Area have only minor and indirect influence on the various markets Opex levels. A profitability framework for understanding individual operators profit dynamics is proposed. 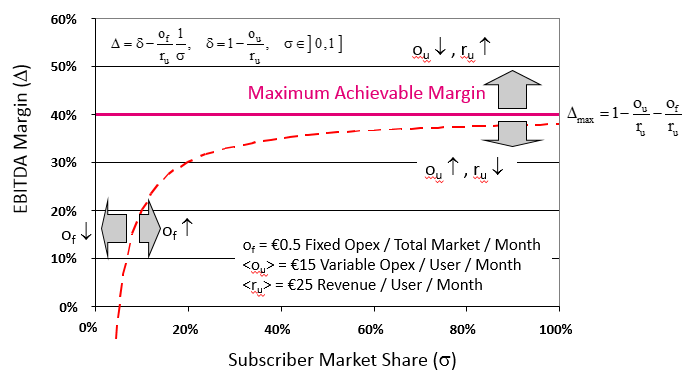 It is shown that Profitability can be written as with being the margin, with ou and ru being the user dependent OpEx and Revenue (i.e., AOPU and ARPU), of the fixed OpEx divided by the Total Subscriber Market and is the subscriber market share. The proposed operator profitability framework provides a high degree of descriptive power and understanding of individual operators margin dynamics as a function of subscriber market share as well as other important economical drivers. I have long & frequently been pondering over the mobile industry’s profitability.In particular, I have spend a lot of my time researching the structure & dynamics of profitability and mapping out factors that contributes in both negative & positive ways? My interest is the underlying cost structures and business models that drives the profitability in both good and bad ways. I have met Executives who felt a similar passion for strategizing, optimizing and managing their companies Telco cost structures and thereby profit and I have also met Executives who mainly cared for the Revenue. Cost is an almost Certainty once made & Revenues are by nature Uncertain. Cost left Unmanaged will by default Increase over time. Revenue is more likely to Decrease over time than increase. Majority of Cost exist on a different & longer time-scale than Revenue. In the following I will use EBITDA, which stands for Earnings Before Interest, Taxes, Depreciation and Amortization, as a measure of profitability and EBITDA to Revenue Ratio as a measure of my profit margin or just margin. It should be clear that EBITDA is a proxy of profitability and as such have shortfalls in specific Accounting and P&L Scenarios. Also according with GAAP (General Accepted Accounting Principles) and under IFRS (International Financial Reporting Standards) EBITDA is not a standardized accepted accounting measure. Nevertheless, both EBITDA and EBITDA Margin are widely accepted and used in the mobile industry as a proxy for operational performance and profitability. I am going to assume that for most purposes & examples discussed in this Blog, EBITDA & the corresponding Margin remains sufficiently good measures profitability. While I am touching upon mobile revenues as an issue for profitability, I am not going to provide much thoughts on how to boost revenues or add new incremental revenues that might compensate from loss of mobile legacy service revenues (i.e., voice, messaging and access). My revenue focus in particular addresses revenue growth on a more generalized level compared to the mobile cost being incurred operating such services in particular and a mobile business in general. For an in-depth and beautiful treatment of mobile revenues past, present and future, I would like to refer to Chetan Sharma’s 2012 paper “Operator’s Dilemma (and Opportunity): The 4th Wave” (note: you can download the paper by following the link in the html article) on mobile revenue dynamics from (1) Voice (1st Revenue or Service Wave), (2) Messaging (2nd Revenue or Service Wave) to todays (3) Access (3rd Revenue Wave) and the commence to what Chetan Sharma defines as the 4th Wave of Revenues (note: think of waves as S-curves describing initial growth spurt, slow down phase, stagnation and eventually decline) which really describes a collection of revenue or service waves (i.e., S-curves) representing a portfolio of Digital Services, such as (a) Connected Home, (b) Connected Car, (c) Health, (d) Payment, (e) Commerce, (f) Advertising, (g) Cloud Services (h) Enterprise solutions, (i) Identity, Profile & Analysis etc.. I feel confident that adding any Digital Service enabled by Internet-of-Things (IoT) and M2M would be important inclusions to the Digital Services Wave. Given the competition (i.e., Facebook, Google, Amazon, Ebay, etc..) that mobile operators will face entering the 4th Wave of Digital Services Space, in combination with having only national or limited international scale, will make this area a tough challenge to return direct profit on. The inherent limited international or national-only scale appears to be one of the biggest barrier to turn many of the proposed Digital Services, particular with those with strong Social Media Touch Points, into meaningful business opportunities for mobile operators. This said, I do believe (strongly) that Telecom Operators have very good opportunities for winning Digital Services Battles in areas where their physical infrastructure (including Spectrum & IT Architecture) is an asset and essential for delivering secure, private and reliable services. Local regulation and privacy laws may indeed turn out to be a blessing for Telecom Operators and other national-oriented businesses. The current privacy trend and general consumer suspicion of American-based Global Digital Services / Social Media Enterprises may create new revenue opportunities for national-focused mobile operators as well as for other national-oriented digital businesses. In particular if Telco Operators work together creating Digital Services working across operator’s networks, platforms and beyond (e.g., payment, health, private search, …) rather than walled-garden digital services, they might become very credible alternatives to multi-national offerings. It is highly likely that consumers would be more willing to trust national mobile operator entities with her or his personal data & money (in fact they already do that in many areas) than a multinational social-media corporation. In addition to the above Digital Services, I do expect that Mobile/Telecom Operators and Entertainment Networks (e.g., satellite, cable, IP-based) will increasingly firm up partnerships as well as acquire & merge their businesses & business models. In all effect this is already happening. For emerging growth markets without extensive and reliable fixed broadband infrastructures, high-quality (& likely higher cost compared to today’s networks!) mobile broadband infrastructures would be essential to drive additional Digital Services and respective revenues as well as for new entertainment business models (other than existing Satellite TV). Anyway, Chetan captures these Digital Services (or 4th Wave) revenue streams very nicely and I recommend very much to read his articles in general (i.e., including “Mobile 4th Wave: The Evolution of the Next Trillion Dollars” which is the 2nd “4th Wave” article). Back to mobile profitability and how to ensure that the mobile business model doesn’t breakdown as revenue growth starts to slow down and decline while the growth of mobile cost overtakes the revenue growth. Our aim must be to ensure sustainable and stable profitability. This can only be done by understanding, careful managing and engineering our basic Telco cost structures. While most Telco’s tend to plan several years ahead for Capital Expenditures (CapEx) and often with a high degree of sophistication, the same Telco’s mainly focus on one (1!) year ahead for OpEx. Further effort channeled into OpEx is frequently highly simplistic and at times in-consistent with the planned CapEx. Obviously, in the growth phase of the business cycle one may take the easy way out on OpEx and focus more on the required CapEx to grow the business. However, as the time-scales for committed OpEx “lives” on a much longer period than Revenue (particular Prepaid Revenue or even CapEx for that matter), any shortfall in Revenue and Profitability will be much more difficult to mitigate by OpEx measures that takes time to become effective. In markets with little or no market investment the penalty can be even harsher as there is no or little OpEx cushion that can be used to soften a disappointing direction in profitability. How come a telecom business in Asia, or other emerging growth markets around the world, can maintain, by European standards, such incredible high EBITDA Margins. Margin’s that run into 50s or even higher. Is this “just” a matter of different lower-cost & low GDP economies? Does the higher margins simply reflect a different stage in the business cycle (i.e., growth versus super-saturation)?, Should Mature Market really care too much about Emerging Growth Markets? in the sense of whether Mature Markets can learn anything from Emerging Growth Markets and maybe even vice versa? (i.e., certainly mature markets have made many mistakes, particular when shifting gears from growth to what should be sustainability). Before all those questions have much of a meaning, it might be instructive to look at the differences between a Mature Market and an Emerging Growth Market. I obviously would not have started this Blog, unless I believe that there are important lessons to be had by understanding what is going on in both types of markets. I also should make it clear that I am only using the term Emerging Growth Markets as most of the markets I study is typically defined as such by economists and consultants. However from a mobile technology perspective few of those markets we tend to call Emerging Growth Markets can really be called emerging any longer and growth has slowed down a lot in most of those markets. This said, from a mobile broadband perspective most of the markets defined in this analysis as Emerging Growth Markets are pretty much dead on that definition. Whether the emerging markets really should be looking forward to mobile broadband data growth might depend a lot on whether you are the consumer or the provider of services. For most Mature Markets the introduction of 3G and mobile broadband data heralded a massive slow-down and in some cases even decline in revenue. This imposed severe strains on Mobile Margins and their EBITDAs. Today most mature markets mobile operators are facing a negative revenue growth rate and is “forced” continuously keep a razor focus on OpEx, Mitigating the revenue decline keeping Margin and EBITDA reasonably in check. Emerging Markets should as early as possible focus on their operational expenses and Optimize with a Vengeance. Well well let ‘s get back to the comparison and see what we can learn! Side Note: it should be clear that by today many of the markets we used to call emerging growth markets are from mobile telephony penetration & business development certainly not emerging any longer and as growing as they were 5 or 10 years ago. This said from a 3G/4G mobile broadband data penetration perspective it might still be fair to characterize those markets as emerging and growing. Though as mature markets have seen that journey is not per se a financial growth story. Looking at the above table we can assess that Firstly: the straightforward (and possible naïve) explanation of relative profitability differences between Mature and Emerging Markets, might be that emerging markets cost structures are much more favorable compared to what we find in mature market economies. Basically the difference between Low and High GDP economies. However, we should not allow ourselves to be too naïve here as lessons learned from low GDP economies are that some cost structure elements (e.g., real estate, fuel, electricity, etc..) are as costly (some times more so) than what we find back in mature high/higher GDP markets. Secondly: many emerging growth market’s economies are substantially more populous & dense than what we find in mature markets (i.e., although it is hard to beat Netherlands or the Ruhr Area in Germany). Maybe the higher population count & population density leads to better scale than can be achieved in mature markets. However, while maybe true for the urban population, emerging markets tend to have substantially higher ratio of their population living in rural areas compared to what we find in mature markets. Thirdly: maybe the go-to-market approach in emerging markets is different from mature markets (e.g., subsidies, quality including network coverage, marketing,…) offering substantially lower mobile quality overall compared to what is the practice in mature markets. Providing poor mobile network quality certainly have been a recurring theme in the Philippines mobile industry despite the Telco Industry in Philippines enjoys Margins that most mature markets operators can only dream of. It is pretty clear that for 3G-UMTS based mobile broadband, 900 MHz does not have sufficient bandwidth to support the anticipated mobile broadband uptake in emerging markets (e.g., particular as 900MHz is occupied by 2G-GSM as well). IF emerging markets mobile operators will want to offer mobile data at reasonable quality levels (i.e., and the IF is intentional), sustain anticipated customer demand and growth they are likely to require network densification (i.e., extra CapEx and OpEx) at 2100 MHz. Alternative they might choose to wait for APT 700 MHz and drive an affordable low-cost LTE device ecosystem albeit this is some years ahead. More than likely some of the answers of why emerging markets have a much better margins (at the moment at least) will have to do with cost-structure differences combined with possibly better scale and different go-to-market requirements more than compensating the low revenue per user. EBITDA (E) = Revenue (R) – OpEx (O) and Margin (M) = EBITDA / Revenue. The EBITDA & Margin tells us in absolute and relative terms how much of our Revenue we keep after all our Operational expenses (i.e., OpEx) have been paid (i.e., beside tax, interests, depreciation & amortization charges).
. We see that even if ARPU is low (or very) low, an Emerging Market with lot of users might match the Revenue of a Mature Market with higher ARPU and worse population scale (i.e., lower amount of users). Pretty simple! But what about the Margin? , in order for an Emerging Market to have substantially better Margin than corresponding Mature Market at the same revenue level, it is clear that the Emerging Market’s OpEx (O) needs to be lower than that of a Mature markets. We also observe that if the Emerging Market Revenue is lower than the Mature Market, the corresponding Opex needs to be even lower than if the Revenues were identical. One would expect that lower GDP countries would have lower Opex (or Cost in general) combined with better population scale is really what makes for a great emerging market mobile Margins! … Or is it ? A Small but essential de-tour into Cost Structure. Usage-related OpEx: typically take up between 10% to 35% of of the total OpEx with an average of ca. 25%. On average this OpEx contribution is approximately 17% of the revenue in mature European markets. Trend wise it is declining. Usage-based OpEx is dominated by interconnect & roaming voice traffic and to a less degree of data interconnect and peering. In a scenario where there is little circuit switched voice left (i.e., the ultimate LTE scenario) this cost element will diminish substantially from the operators cost structure. It should be noted that this also to some extend is being influenced by regulatory forces. Market Invest: can be decomposed into Subscriber Acquisition Cost (SAC), i.e., “bribing” the customers to leave your competitor for yourself, Subscriber Retention Cost (SRC), i.e., “bribing” your existing (valuable) customers to not let them be “bribed” by you’re a competitor and leave you (i.e., churn), and lastly Other Marketing spend for advertisement, promotional and so forth. This cost-structure element contribution to OpEx can vary greatly depending on the market composition. In Europe’s mature markets it will vary from 10% to 31% with a mean value of ca. 23% of the total OpEx. On average it will be around 14% of the Revenue. It should be noted that as the mobile penetration increases and enter into heavy saturation (i.e., >100%), SAC tends to reduce and SRC will increase. Further in markets that are very prepaid heavy SAC and SRC will naturally be fairly minor cost structure element (i.e., 10% of OpEx or lower and only a couple of % of Revenue). Profit and Margin can rapidly be influenced by changes in the market invest. SAC and SRC cost-structure elements will in general be small in emerging growth markets (compared to corresponding mature markets). Terminal-equipment related OpEx: is the cost associated by procuring terminals equipment (i.e, handsets, smartphones, data cards, etc.). In the past (prior to 2008) it was fairly common that OpEx from procuring and revenues from selling terminals were close to a zero-sum game. In other words the cost made for the operator of procuring terminals was pretty much covered by re-selling them to their customer base. This cost structure element is another heavy weight and vary from 10% to 20% of the OpEx with an average in mature European markets of 17%. Terminal-related cost on average amounts to ca. 11% of the Revenue (in mature markets). Most operators in emerging growth markets don’t massively procure, re-sell and subsidies handsets, as is the case in many mature markets. Typically handsets and devices in emerging markets will be supplied by a substantial 2nd hand gray and black market readily available. Personnel Cost: amounts to between 6% to 15% of the Total OpEx with a best-practice share of around the 10%. The ones who believe that this ratio is lower in emerging markets might re-think their impression. In my experience emerging growth markets (including the ones in Eastern & Central Europe) have a lower unit personnel cost but also tends to have much larger organizations. This leads to many emerging growth markets operators having a personnel cost share that is closer to the 15% than to the 10% or lower. On average personnel cost should be below 10% of revenue with best practice between 5% and 8% of the Revenue. Technology Cost (Network & IT) – continued: Although, above Chart (i.e., taken from my 2012 Keynote at the Broadband MEA 2012, Dubai “Ultra-efficient network factory: Network sharing and other means to leapfrog operator efficiencies”) emphasizes a Mature Market View, emerging markets cost distribution does not differ that much from the above with a few exceptions. In Emerging Growth Markets with poor electrification rates diesel generators and the associated diesel full will strain the Energy Cost substantially. As the biggest exposure to poor electrical grid (in emerging markets) in general tend to be in Rural and Sub-Urban areas it is a particular OpEx concern as the emerging market operators expands towards Rural Areas to capture the additional subscriber potential present there. Further diesel fuel has on average increased with 10% annually (i..e, over the least 10 years) and as such is a very substantial Margin and Profitability risk if a very large part of the cellular / mobile network requires diesel generators and respective fuel. Obviously, “Rental & Leasing” as well as “Service & Maintenance” & “Personnel Cost” would be positively impacted (i.e., reduced) by Network Sharing initiatives. Best practices Network Sharing can bring around 35% OpEx savings on relevant cost structures. For more details on benefits and disadvantages (often forgotten in the heat of the moment) see my Blog “The ABC of Network Sharing – The Fundamentals”. In my experience one of the greatest opportunities in Emerging Growth Markets for increased efficiency are in the Services part covering Maintenance & Repair (which obviously also incudes field maintenance and spare part services). Other Cost: typically covers the rest of OpEx not captured by the above specific items. It can also be viewed as overhead cost. It is also often used to “hide” cost that might be painful for the organization (i.e., in terms of authorization or consequences of mistakes). In general you will find a very large amount of smaller to medium cost items here rather than larger ones. Best practices should keep this below 10% of total OpEx and ca. 5% of Revenues. Much above this either means mis-categorization, ad-hoc projects, or something else that needs further clarification. So how does this help us compare a Mature Mobile Market with an Emerging Growth Market? As already mentioned in the description of the above cost structure categories particular Market Invest and Terminal-equipment Cost are items that tend to be substantially lower for emerging market operators or entirely absent from their cost structures. 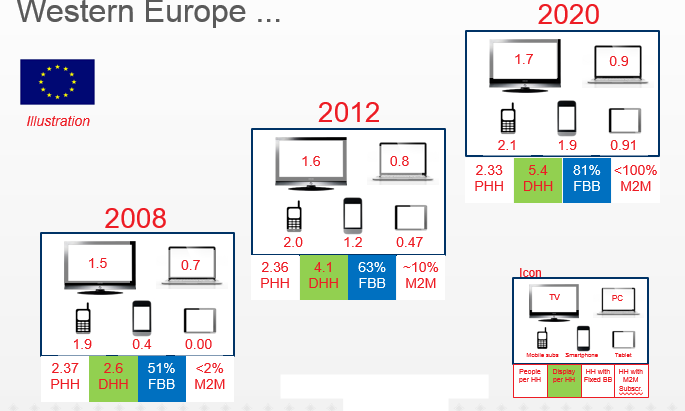 Lets assume our average mobile operator in an average mature mobile market (in Western Europe) have a Margin of 36%. 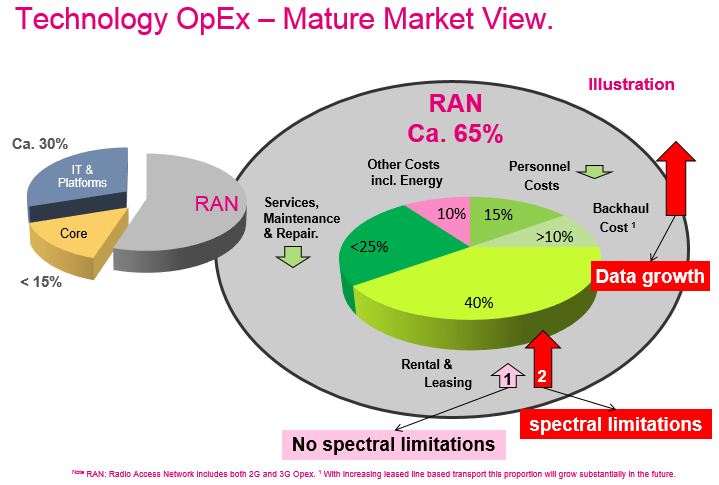 In its existing (OpEx) cost structure they spend 15% of Revenue on Market Invest of which ca. 53% goes to subscriber acquisition (i.e., SAC cost category), 40% on subscriber retention (SRC) and another 7% for other marketing expenses. Further, this operator has been subsidizing their handset portfolio (i.e., Terminal Cost) which make up another 10% of the Revenue. Our Average Operator comes up with the disruptive strategy to remove all SAC and SRC from their cost structure and stop procuring terminal equipment. Assuming (and that is a very big one in a typical western European mature market) that revenue remains at the same level, how would this average operator fare? Removing SAC and SRC, which was 14% of the Revenue will improve the Margin adding another 14 percentage points. Removing terminal procurement from its cost structure leads to an additional Margin jump of 10 percentage points. The final result is a Margin of 60% which is fairly close to some of the highest margins we find in emerging growth markets. Obviously, completely annihilating Market Invest might not be the most market efficient move unless it is a market-wide initiative. Albeit the example might be perceived as a wee bit academic, it serves to illustrate that some of the larger margin differences we observe between mobile operators in mature and emerging growth markets can be largely explain by differences in the basic cost structure, i..e, the lack of substantial subscriber acquisition and retention costs as well as not procuring terminals does offer advantages to the emerging market business model. However, it also means that many operators in emerging markets have little OpEx flexibility, in the sense of faster OpEx reduction opportunities once mobile margin reduces due to for example slowing revenue growth. This typical becomes a challenge as mobile penetration starts reaching saturation and as ARPU reduces due to diminishing return on incremental customer acquisition. There is not much substantial OpEx flexibility (i..e, market invest & terminal procurement) in Emerging Growth Markets mobile accounts. This adds to the challenge of avoiding profitability squeeze and margin exposure by quickly scaling back OpEx. This is to some extend different from mature markets that historically had quiet a few low hanging fruits to address before OpEx efficiency and reduction became a real challenge. Though ultimately it does become a challenge. Back to Profitability with a Vengeance. So it is all pretty simple! … leave out Market Invest and Terminal Procurement … Then add that we typically have to do with Lower GDP countries which conventional wisdom would expect also to have lower Opex (or Cost in general) combined with better population scale .. isn’t that really what makes for a great emerging growth market Mobile Margin? In the Chart above the Y-axis is depicted with logarithmic scaling in order to provide a better impression of the data points across the different economies. 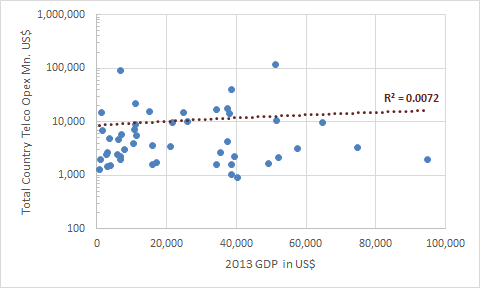 It should be noted that throughout the years 2007 to 2013 (note: 2013 data is shown above) there is no correlation between a countries mobile Opex, as estimated by Revenue – EBITDA, and the GDP. Well … GDP really doesn’t provide the best explanation (to say the least)! … So what does then? I have carried out multi-linear regression analysis on the available data from the “Bank of America Merrill Lynch (BoAML) Global Wireless Matrix Q1, 2014” datasets between the years 2007 to 2013. The multi-linear regression approach is based on year-by-year analysis of the data with many different subsets & combination of data chosen including adding random data. Population – The higher the size of the population, proportional less Mobile Market Opex is spend (i.e., scale advantage). Penetration – The higher the mobile penetration, proportionally less Mobile Market Opex is being spend (i.e., scale advantage and the incremental penetration at an already high penetration would have less value thus less Opex should be spend). Users (i..e., as measured by subscriptions) – The more Users the higher the Mobile Market Opex (note: prepaid ratio has not been found to add statistical significance). ARPU (Average Revenue Per User) – The higher the ARPU, the higher will the Mobile Market Opex be. If I leave out ARPU, GDP does enter as a possible descriptive candidate although the overall quality of the regression analysis suffers. However, it appears that the GDP and ARPU cannot co-exist in the analysis. When Mobile Market ARPU data are included, GDP becomes non-significant. Furthermore, a countries Surface Area, which I previously believed would have a sizable impact on a Mobile Market’s OpEx, also does not enter as a significant descriptive parameter in this analysis. In general the Technology related OpEx is between 15% to 25% (maximum) of the Total OpEx and out that possible 40% to 60% would be related to sites that would be needed to cover a given surface area. This might no be significant enough in comparison to the other parameters or simply not a significant factor in the overall country related mobile OpEx. I had also expected 3G-UMTS to have had a significant contribution to the Opex. However this was not very clear from the analysis either. Although in the some of the earlier years (2005 – 2007), 3G does enter albeit not with a lot of weight. 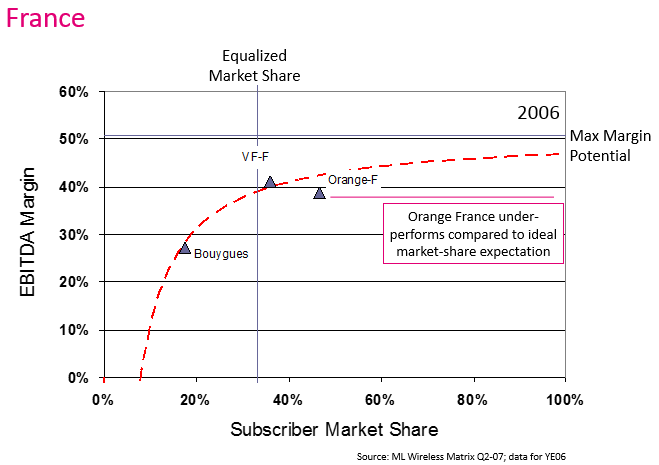 In Western Europe most incremental OpEx related to 3G has been absorb in the existing cost structure and very little (if any) incremental OpEx would be visible particular after 2007. This might not be the case in most Emerging Markets unless they can rely on UMTS deployments at 900 MHz (i.e., the traditional GSM band). Also the UMTS 900 solution would only last until capacity demand require the operators to deploy UMTS 2100 (or let their customers suffer with less mobile data quality and keep the OpEx at existing levels). In rural areas (already covered by GSM at 900 MHz) the 900 MHz UMTS deployment option may mitigate incremental OpEx of new site deployment and further encourage rural active network sharing to allow for lower cost deployment and providing rural populations with mobile data and internet access. The Population Size of a Country, the Mobile Penetration and the number of Users and their ARPU (note last two basically multiplies up to the revenue) are most clearly driving a mobile markets Opex. Philippines versus Germany – Revenue, Cost & Profitability. Philippines in 2013 is estimated to have a population of ca. 100 Million compared to Germany’s ca. 80 Million. The Urban population in Germany is 75% taking up ca. 17% of the German surface area (ca. 61,000 km2 or a bit more than Croatia). Comparison this to Philippines 50% urbanization that takes up up only 3% (ca. 9,000 km2 or equivalent to the surface area of Cyprus). Germany surface area is about 20% larger than Philippines (although the geographies are widely .. wildly may be a better word … different, with the Philippines archipelago comprising 7,107 islands of which ca. 2,000 are inhabited, making the German geography slightly boring in comparison). In principle if all I care about is to cover and offer services to the urban population (supposedly the ones with the money?) I only need to cover 9 – 10 thousand square kilometer in the Philippines to capture ca. 50 Million potential mobile users (or 5,000 pop per km2), while I would need to cover about 6 times that amount of surface area to capture 60 million urban users in Germany (or 1,000 pop per km2). Even when taking capacity and quality into account, my Philippine cellular network should be a lot smaller and more efficient than my German mobile network. If everything would be equal, I basically would need 6 times more sites in Germany compared to Philippines. Particular if I don’t care too much about good quality but just want to provide best effort services (that would never work in Germany by the way). Philippines would win any day over Germany in terms of OpEx and obviously also in terms of capital investments or CapEx. It does help the German Network Economics that the ARPU level in Germany is between 4 times (in 2003) to 6 times (in 2013) higher than in Philippines. Do note that the two major Germany mobile operators covers almost 100% of the population as well as most of the German surface area and that with a superior quality of voice as well as mobile broadband data. This does not true hold true for Philippines. In 2003 a mobile consumer in Philippines would spend on average almost 8 US$ per month for mobile services. This was ca. 4x lower than a German customer for that year. The 2003 ARPU of the Philippines roughly corresponded to 10% of the GDP per Capita versus 1.2% of the German equivalent. Over the 10 Years from 2003 to 2013, ARPU dropped 60% in Philippine and by 2013 corresponded to ca. 1.5% of GDP per Capita (i.e., a lot more affordable propositions). The German 2013 ARPU to GDP per Capita ratio was 0.5% and its ARPU was ca. 40% lower than in 2003. 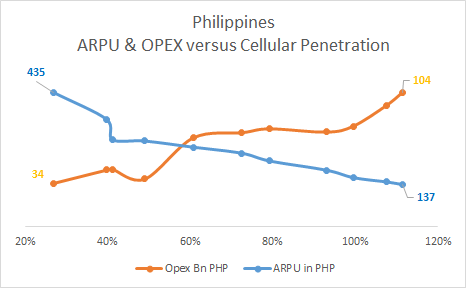 The Philippines ARPU decline and Opex increase over the 10 year period led to a Margin drop from 64% to 45% (19% drop!) and their Margin is still highly likely to fall further in the near to medium-term. Despite the Margin drop Philippines still made a PHP26 Billion more EBITDA in 2013 than compared to 2003 (ca. 45% more or equivalent compounded annual growth rate of 3.8%). Germany had ca. 3x more mobile subscribers compared to Philippines. German Mobile Revenue was 14x higher than Philippines. German EBITDA was 9x higher than that of Philippines. German OpEx was 23x higher than that of Philippines Mobile Industry. Mobile Margin of the Philippines was 64% versus 42% of Germany. Germany’s GPD per Capita (in US$) was 35 times larger than that of Philippines. Germany’s mobile ARPU was 4 times higher than that of Philippines. Philippines & Germany have almost the same amount of mobile subscriptions. Germany Mobile Revenue was 6x higher than Philippines. German EBITDA was only 5x higher than that of Philippines. German OpEx was 6x higher than Mobile OpEx in Philippines (and German OpEx was at level with 2003). 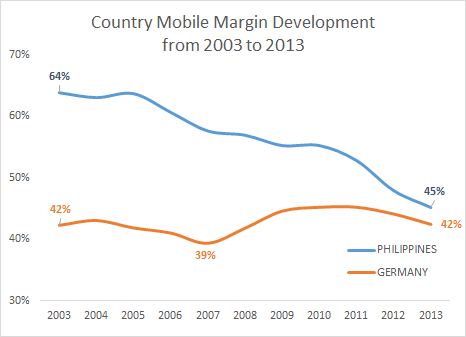 Mobile Margin of the Philippines dropped 19% to 45% compared to 42% of Germany (essential similar to 2003). In local currencies, Philippines increased their EBITDA with ca. 45%, Germany remain constant. Both Philippines and Germany has lost 11% in absolute EBITDA between the 10 Year periods maximum and 2013. Germany’s GDP per Capita (in US$) was 14 times larger than that of the Philippines. Germany’s ARPU was 6 times higher than that of Philippines. In the Philippines, mobile revenues have grown with 7.4% per anno (between 2003 and 2013) while the corresponding mobile OpEx grew with 12% and thus eroding margin massively over the period as increasingly more mobile customers were addressed. 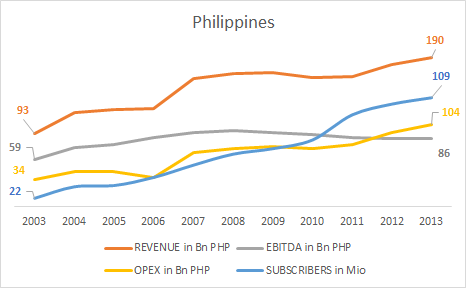 In Philippines, the 2013 OpEx level was 3 times that of 2003 (despite one major network consolidation and being an essential duopoly after the consolidation). In Philippines over this period the annual growth rate of mobile users were 17% (versus Germany’s 6%). In absolute terms the number of users in Germany and Philippines were almost the same in 2013, ca. 115 Million versus 109 Million. In Germany over the same period Financial growth was hardly present although more than 50 Million subscriptions were added. When OpEx grows faster than Revenue, Profitability will suffer today & even more so tomorrow. Mobile capital investments (i.e., CapEx) over the period 2003 to 2013 was for Germany 5 times higher than that of Philippines (i.e., remember that Germany also needs at least 5 – 6 times more sites to cover the Urban population) and tracks at a 13% Capex to Revenue ratio versus Philippines 20%. The stories of Mobile Philippines and of Mobile Germany are not unique. Likewise examples can be found in Emerging Growth Markets as well as Mature Markets. Can Mature Markets learn or even match (keep on dreaming?) from Emerging Markets in terms of efficiency? Assuming such markets really are efficient of course! As logic (true or false) would dictate given the relative low ARPUs in emerging growth markets and their correspondingly high margins, one should think that such emerging markets are forced to run their business much more efficient than in Mature Markets. While compelling to believe this, the economical data would indicate that most emerging growth markets have been riding the subscriber & revenue growth band wagon without too much thoughts to the OpEx part … and Frankly why should you care about OpEx when your business generates margins much excess of 40%? Well … it is (much) easier to manage & control OpEx year by year than to abruptly “one day” having to cut cost in panic mode when growth slows down the really ugly way and OpEx keeps increasing without a care in the world. Many mature market operators have been in this situation in the past (e.g., 2004 – 2008) and still today works hard to keep their margins stable and profitability from declining. Most Companies will report both Revenues and EBITDA on quarterly and annual basis as both are key financial & operational indicators for growth. They tend not report Opex but as seen from above that’s really not a problem to estimate when you have Revenue and EBITDA (i.e., OpEx = Revenue – EBITDA). Thus, had you left the European Telco scene (assuming you were there in the first place) for the last 10 years and then came back you might have concluded that not much have happened in your absence … at least from a profitability perspective. Germany was in 2013 almost at its Ebitda margin level of 2003. Of course as the ones who did not take a long holiday knows those last 10 years were far from blissful financial & operational harmony in the mature markets where one efficiency program after the other struggled to manage, control and reduce Operators Operational Expenses. However, over that 10-year period Germany added 50+ Million mobile subscriptions and invested more than 37 Billion US$ into the mobile networks from T-Deutschland, Vodafone, E-plus and Telefonica-O2. The mobile country margin over the 10-year period has been ca. 43% and the Capex to Revenue ratio ca. 13%. By 2013 the total amount of mobile subscription was in the order of 115 Million out of a population of 81 Million (i.e., 54 Million of the German population is between 15 and 64 years of age). The observant numerologist would have realized that there are many more subscriptions than population … this is not surprising as it reflects that many subscribers are having multiple different SIM cards (as opposed to cloned SIMs) or subscription types based on their device portfolio and a host of other reasons. All Wunderbar! … or? .. well not really … Take a look at the revenue and profitability over the 10 year period and you will find that no (or very very little) revenue and incremental profitability has been gained over the period from 2003 to 2013. AND we did add 80+% more subscriptions to the base! Apart from adding subscribers, having modernized the mobile networks at least twice over the period (i.e, CapEx with little OpEx impact) and introduced LTE into the German market (i.e., with little additional revenue to show for it) not much additional value has been added. It is however no small treat what has happen in Germany (and in many other mature markets for that matter). Not only did Germany almost double the mobile customers (in terms of subscriptions), over the period 3G Nodes-B’s were over-layed across the existing 2G network. Many additional sites were added in Germany as the fundamental 2G cellular grid was primarily based on 900 MHz and to accommodate the higher UMTS frequency (i.e., 2100 MHz) more new locations were added to provide a superior 3G coverage (and capacity/quality). Still Germany managed all this without increasing the Mobile Country OpEx across the period (apart from some minor swings). This has been achieved by a tremendous attention to OpEx efficiency with every part of the Industry having razor sharp attention to cost reduction and operating at increasingly efficiency. Philippines story is a Fabulous Story of Growth (as summarized above) … and of Profitability & Margin Decline. Philippines today is in effect a duopoly with PLDT having approx. 2/3 of the mobile market and Globe the remaining 1/3. During the period the Philippine Market saw Sun Cellular being acquired and merged by PLDT. Further, 3G was deployed and mobile data launched in major urban areas. SMS revenues remained the largest share of non-voice revenue to the two remaining mobile operators PLDT and Globe. Over the period 2003 to 2013, the mobile subscriber base (in terms of subscriptions) grew with 16% per anno and the ARPU fell accordingly with 10% per anno (all measured in local currency). All-in-all safe guarding a “healthy” revenue increase over the period from ca. 93 Billion PHP in 2003 to 190 Billion PHP in 2013 (i.e., a 65% increase over the period corresponding to a 5% annual growth rate). However, the Philippine market could not maintain their relative profitability & initial efficiency as the mobile market grew. So we observe (at least) two effects (1) Reduction in ARPU as market is growing & (2) Increasing Opex cost to sustain the growth in the market. As more customers are added to a mobile network the return on thus customers increasingly diminishes as network needs to be massively extended capturing the full market potential versus “just” the major urban potential. Mobile Philippines did become less economical efficient as its scale increases and ARPU dropped (i.e., by almost 70%). This is not an unusual finding across Emerging Growth Markets. 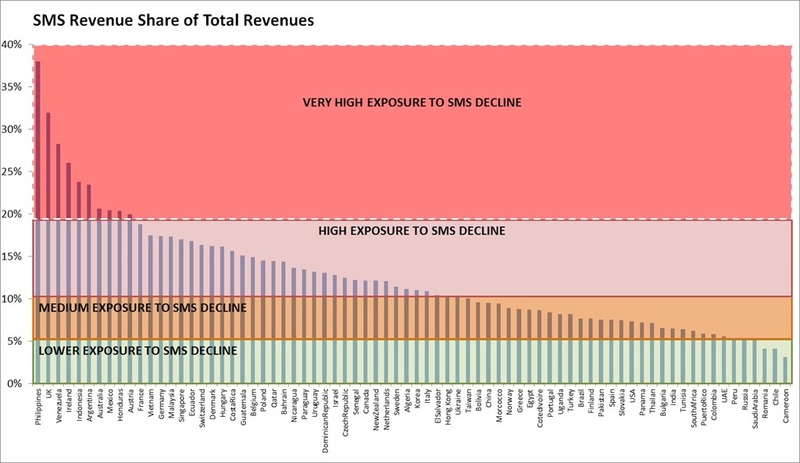 As I have described in my previous Blog “SMS – Assimilation is inevitable, Resistance is Futile!”, Philippines mobile market has an extreme exposure to SMS Revenues which amounts to more than 35% of Total Revenues. Particular as mobile data and smartphones penetrate the Philippine markets. As described in my previous Blog, SMS Services enjoy the highest profitability across the whole range of mobile services we offer the mobile customer including voice. As SMS is being cannibalized by IP-based messaging, the revenue will decline dramatically and the mobile data revenue is not likely to catch up with this decline. Furthermore, profitability will suffer as the the most profitable service (i.e., SMS) is replaced by mobile data that by nature has a different profitability impact compared to simple SMS services. Philippines do not only have a substantial Margin & EBITDA risk from un-managed OpEx but also from SMS revenue cannibalization (a la KPN in the Netherlands and then some). Mobile Germany managed their Cost Structure despite 40+% decrease in ARPU and as another 60% in mobile penetration was added to the mobile business. Again similar trend will be found in most Mature Markets in Western Europe. 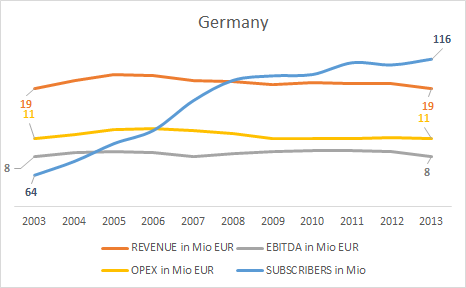 One may argue (and not being too wrong) that Germany (and most mature mobile markets) in 2003 already had most of its OpEx bearing organization, processes, logistics and infrastructure in place to continue acquiring subscribers (i.e., as measured in subscriptions). Therefor it have been much easier for the mature market operators to maintain their OpEx as they continued to grow. Also true that many emerging mobile markets did not have the same (high) deployment and quality criteria, as in western mature markets, in their initial network and service deployment (i.e., certainly true for the Philippines as is evident from the many Regulatory warnings both PLDT and Globe received over the years) providing basic voice coverage in populated areas but little service in sub-urban and rural areas. Most of the initial emerging market networks has been based on coarse (by mature market standards) GSM 900 MHz (or CDMA 850 MHz) grids with relative little available capacity and indoor coverage in comparison to population and clutter types (i.e., geographical topologies characterized by their cellular radio interference patterns). The challenge is, as an operator wants to capture more customers, it will need to build out / extend its mobile network in the areas those potential or prospective new customers live and work in. From a cost perspective sub-urban and rural areas in emerging markets are not per se lower cost areas despite such areas in general being lower revenue areas than their urban equivalents. Thus, as more customers are added (i.e., increased mobile penetration) proportionally more cost are generated than revenue being capture and the relative margin will decline. … and this is how the Ugly-cost (or profitability tail) is created. I just cannot write about profitability and cost structure without throwing the Ugly-(cost)-Tail on the page.I strongly encourage all mobile operators to make their own Ugly-Tail analysis. You will find more details of how to remedy this Ugliness from your cost structure in “The ABC of Network Sharing – The Fundamentals”. In Western Europe’s mature mobile markets we find that more than 50% of our mobile cellular sites captures no more than 10% of the Revenues (but we do tend to cover almost all surface area several times unless the mobile operators have managed to see the logic of rural network sharing and consolidated those rural & sub-urban networks). 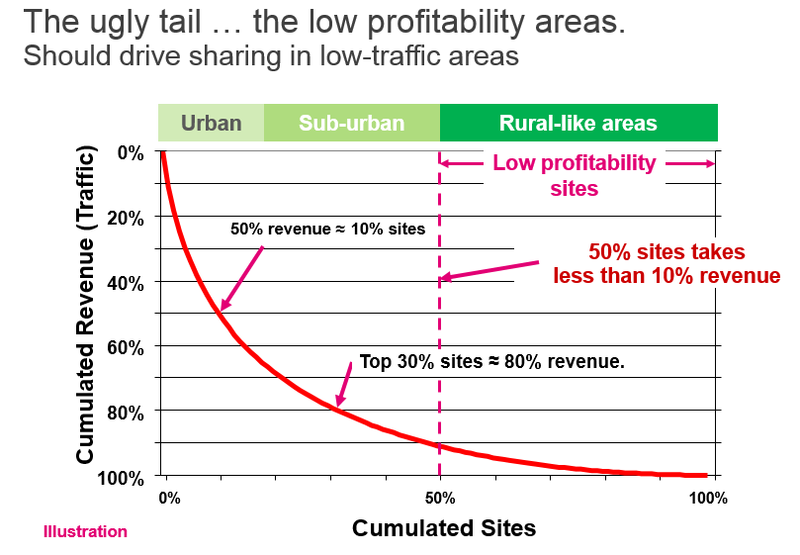 Given emerging mobile markets have “gone less over board” in terms of lowest revenue un-profitable network deployments in rural areas you will find that the number of sites carrying 10% of less of the revenue is around 40%. It should be remembered that the rural populations in emerging growth markets tend to be a lot larger than in of that in mature markets and as such revenue is in principle spread out more than what would be the case in mature markets. Population & Mobile Statistics and Opex Trends. The following provides a 2013 Summary of Mobile Penetration, 3G Penetration (measured in subscriptions), Urban Population and the corresponding share of surface area under urban settlement. Further to guide the eye the 100% line has been inserted (red solid line), a red dotted line that represents the share of the population that is between 15 and 64 years of age (i.e., who are more likely to afford a mobile service) and a dashed red line providing the average across all the 43 countries analyzed in this Blog. Sources: United Nations, Department of Economic & Social Affairs, Population Division. The UN data is somewhat outdated though for most data points across emerging and mature markets changes have been minor. Mobile Penetration is based on Pyramid Research and Bank of America Merrill Lynch Global Wireless Matrix Q1, 2014. Index Mundi is the source for the Country Age structure and data for %tage of population between 15 and 64 years of age and shown as a red dotted line which swings between 53.2% (Nigeria) to 78.2% (Singapore), with an average of 66.5% (red dashed line). There are no real emerging markets any longer in the sense of providing basic mobile telephone services such as voice and messaging. For mobile broadband data via 3G-UMTS (or LTE for that matter), what we tend to characterize as emerging markets are truly emerging or in some case nascent (e.g., Algeria, Iraq, India, Pakistan, etc..). All mature markets have mobile penetration rates way above 100% with exception of Canada, i.e., 80% (i.e., though getting to 100% in Canada might be a real challenge due to a very dispersed remaining 20+% of the population). Most emerging markets are by now covering all urban areas and corresponding urban population. Many have also reach 100% mobile penetration rates. Most Emerging Markets are lagging Western Mature Markets in 3G penetration. Even providing urban population & urban areas with high bandwidth mobile data is behind that of mature markets. Size & density does matter … in all kind of ways when it comes to the economics of mobile networks and the business itself. In Australia I only need to cover ca. 40 thousand km2 (i.e., 0.5% of the total surface area and a bit less than the size of Denmark) to have captured almost 90% of the Australian population (e.g., Australia’s total size is 180+ times that of Denmark excluding Greenland). I frequently hear my Australian friends telling me how Australia covers almost 100% of the population (and I am sure that they cover more area than is equivalent to Denmark too) … but without being (too) disrespectful that record is not for Guinness Book of Records anytime soon. in US (e.g., 20% more surface area than Australia) I need to cover in almost 800 thousand km2 (8.2% of surface area or equivalent to a bit more than Turkey) to capture more than 80% of the population. In Thailand I can only capture 35% of the population by covering ca. 5% of the surface area or a little less than 30 thousand km2 (approx. the equivalent of Belgium). The remaining of 65% of the Thai population is rural-based and spread across a much larger surface area requiring extensive mobile network to provide coverage to and capture additional market share outside the urban population. So in Thailand I might need a bit less cell sites to cover 35% of my population (i.e., 22M) than in Australia to cover almost 90% of the population (i.e., ca. 21M). That’s pretty cool economics for Australia which is also reflected in a very low profitability risk score. For Thailand (and other countries with similar urban demographics) it is tough luck if they want to reach out and get the remaining 65% of their population. The geographical dispersion of the population outside urban areas is very wide and increasing geographical area is required to be covered in order to catch this population group. UMTS at 900 MHz will help to deploy economical mobile broadband, as will LTE in the APT 700 MHz band (being it either FDD Band 28 or TDD Band 44) as the terminal portfolio becomes affordable for rural and sub-urban populations in emerging growth markets. In Western Europe on average I can capture 77% of my population (i..e, the urban pop) covering 14.2% of the surface area (i.e., average over markets in this analysis), This is all very agreeable and almost all Western European countries cover their surface areas to at least 80% and in most cases beyond that (i.e., it’s just less & easier land to cover though not per see less costly). In most cases rural coverage is encourage (or required) by the mature market license regime and not always a choice of the mobile operators. Before we look in depth to the growth (incl. positive as well as negative growth), lets first have a peek at what has happened to the mobile revenue in terms of ARPU and Number of Mobile User and the corresponding mobile penetration over the period 2007 to 2013. Source: Bank of America Merrill Lynch Global Wireless Matrix Q1, 2014 and Pyramid Research Data data were used to calculated the growth of ARPU as compounded annual growth rate between 2007 to 2013 and the annual growth rate between 2012 and 2013. 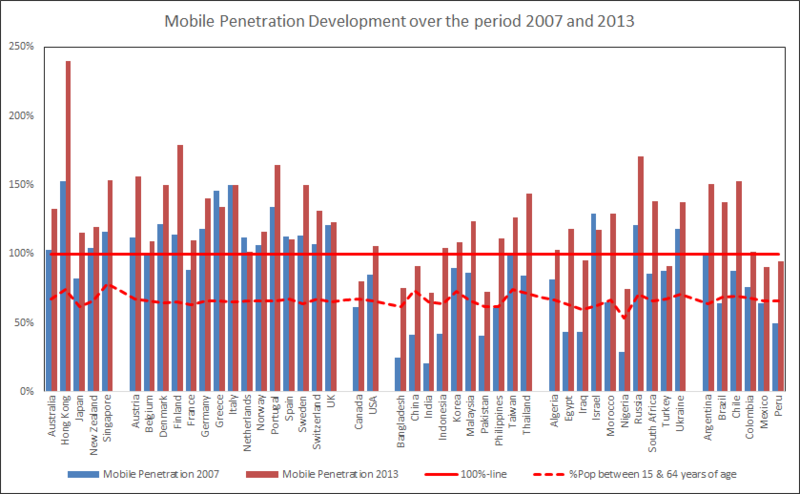 Since 2007 the mobile ARPUs have been in decline and to make matters worse the decline has even accelerated rather than slowed down as markets mobile penetration saturated. Source: Mobile Penetrations taken from Bank of America Merrill Lynch Global Wireless Matrix Q1, 2014 and Pyramid Research Data data .Index Mundi is the source for the Country Age structure and data for %tage of population between 15 and 64 years of age and shown as a red dotted line which swings between 53.2% (Nigeria) to 78.2% (Singapore), with an average of 66.5% (red dashed line). It s interesting to observe that most emerging growth markets are now where the mature markets were in 2007 in terms of mobile penetration. Apart from a very few markets, ARPU has been in a steady decline since 2007. 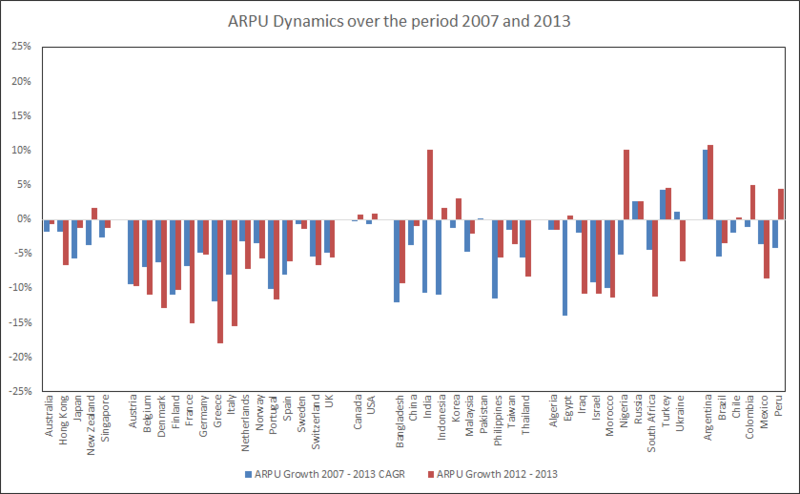 Further in many countries the ARPU decline has even accelerated rather than slowed down. 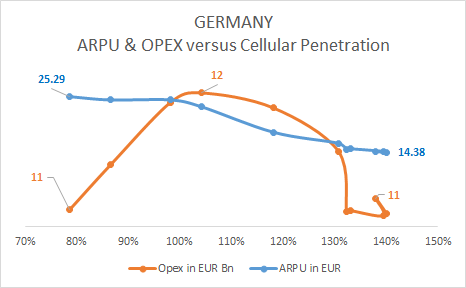 From most mature markets the conclusion that we can draw is that there are no evidence that mobile broadband data (via 3G-UMTS or LTE) has had any positive effect on ARPU. Although some of the ARPU decline over the period in mature markets (particular European Union countries) can be attributed to regulatory actions. In general as soon a country mobile penetration reaches 100% (in all effect reaches the part of the population 15-64 years of age) ARPU tends to decline faster rather than slowing down. Of course one may correctly argue that this is not a big issue as long as the ARPU times the Users (i.e., total revenue) remain growing healthily. However, as we will see that is yet another challenge for the mobile industry as also the total revenue in mature markets also are in decline on a year by year basis. Given the market, revenue & cost structures of emerging growth markets, it is not unlikely that they will face similar challenges to their mobile revenues (and thus profitability). This could have a much more dramatic effect on their overall mobile economics & business models than what has been experienced in the mature markets which have had a lot more “cushion” on the P&Ls to defend and even grow (albeit weakly) their profitability. It is instructive to see that the most emerging growth markets mobile penetrations have reached the levels of Mature Markets in 2007. Combined with the introduction and uptake of mobile broadband data this marks a more troublesome business model phase than what these markets have experienced in the past.Some of the emerging growth market have yet to introduce 3G-UMTS, and some to leapfrog mobile broadband by launching LTE. Both events, based on lessons learned from mature markets, heralds a more difficult business model period of managing cost structures while defending revenues from decline and satisfy customers appetite for mobile broadband internet that cannot be supported by such countries fixed telecommunications infrastructures. For us to understand more profoundly where our mobile profitability is heading it is obviously a good idea to understand how our Revenue and OpEx is trending. In this Section I am only concerned about the Mobile Market in Country and not the individual mobile operators in the country. For that latter (i.e., Operator Profitability) you will find a really cool and exiting analytic framework in the Section after this. I am also not interested (in this article) in modeling the mobile business bottom up (been there & done that … but that is an entirely different story line). However, I am interested and I am hunting for some higher level understanding and a more holistic approach that will allow me to probabilistically (by way of Bayesian analysis & ultimately inference) to predict in which direction a given market is heading when it comes to Revenue, OpEx and of course the resulting EBITDA and Margin. The analysis I am presenting in this Section is preliminary and only includes compounded annual growth rates as well as the Year-by-Year growth rates of Revenue and OpEx. Further developments will include specific market & regulatory developments as well to further improve on the Bayesian approach. Given the wealth of data accumulated over the years from the Bank of America Merrill Lynch (BoAML) Global Wireless Matrix datasets it is fairly easy to construct & train statistical models as well as testing those consistent with best practices. The Chart below comprises 48 countries Revenue & OpEx growth rates as derived from the “Bank of America Merrill Lynch (BoAML) Global Wireless Matrix Q1, 2014” dataset (note: BoAML data available in this analysis goes back to 2003). Out of the 48 Countries, 23 countries have an Opex compounded annual growth rate higher than the corresponding Revenue growth rate. Thus, it is clear that those 23 countries are having a higher risk of reduced margin and strained profitability due to over-proportionate growth of OpEx. Out of the 23 countries with high or very high profitability risk, 11 countries have been characterized in macro-economical terms as emerging growth markets (i.e., China, India, Indonesia, Philippines, Egypt, Morocco, Nigeria, Russia, Turkey, Chile, Mexico) the remaining 12 countries can be characterized as mature markets in macro-economical terms (i.e., New Zealand, Singapore, Austria, Belgium, France, Greece, Spain, Canada, South Korea, Malaysia, Taiwan, Israel). Furthermore, 26 countries had a higher Opex growth between 2012 and 2013 than their revenues and is likely to be trending towards dangerous territory in terms of Profitability Risk. Source: Bank of America Merrill Lynch Global Wireless Matrix Q1, 2014. Revenue depicted here is Service Revenues and the OPEX has been calculated as Service REVENUE minus EBITDA. The Compounded Annual Growth Rate (CAGR) is calculated with X being Revenue and Opex. Y-axis scale is from -25% to +25% (i.e., similar to the scale chosen in the Year- by-Year growth rate shown in the Chart below). With few exceptions one does not need to read the countries names on the Chart above to immediately see where we have the Mature Markets with little or negative growth and where what we typically call emerging growth markets are located. As the above Chart clearly illustrate the mobile industry across different types of markets have an increasing challenge to deliver profitable growth and if the trend continues to keep their profitability period! Opex grows faster than Mobile Operator’s can capture Revenue … That’s a problem! In order gauge whether the growth dynamics of the last 7 years is something to be concerned about (it is! … it most definitely is! but humor me!) … it is worthwhile to take a look at the year by year growth rate trends (i.e. as CAGR only measures the starting point and the end point and “doesn’t really care” about what happens in the in-between years). Source: Bank of America Merrill Lynch Global Wireless Matrix Q1, 2014. Revenue depicted here is Service Revenues and the OPEX has been calculated as Service REVENUE minus EBITDA. Year on Year growth is calculated and is depicted in the Chart above. Y-axis scale is from -25% to +25%. Note that the Y-scales in the Year-on-Year Growth Chart and the above 7-Year CAGR Growth Chart are the same and thus directly comparable. From the Year on Year Growth dynamics compared to the compounded 7-year annual growth rate, we find that Mature Markets Mobile Revenues decline has accelerated. 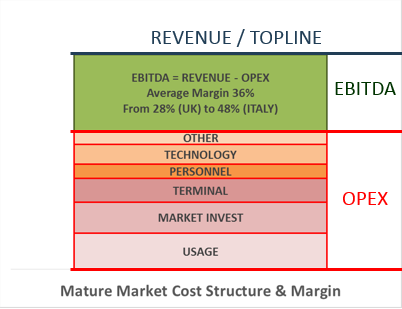 However, in most cases the Mature Market OpEx is declining as well and the Control & Management of the cost structure has improved markedly over the last 7 years. Despite the cost structure management most Mature Markets Revenue have been declining faster than the OpEx. As a result Profitability Squeeze remains a substantial risk in Mature Markets in general. In almost all Emerging Growth Markets the 2013 to 2012 revenue growth rate has declined in comparison with the compounded annual growth rate. Not surprising as most of those markets are heading towards 100% mobile penetration (as measured in subscriptions). OpEx growth remains a dire concern for most of the emerging growth markets and will continue to squeeze emerging markets profitability and respective margins. There is no indication (in the dataset analyzed) that OpEx is really under control in Emerging Growth Markets, at least to the same degree as what is observed in the Mature Markets (i.e., particular Western Europe). What further adds to the emerging markets profitability risk is that mobile data networks (i.e., 3G-UMTS, HSPA+,..) and corresponding mobile data uptakes are just in its infancy in most of the Emerging Growth Markets in this analysis. The networks required to sustain demand (at a reasonable quality) are more extensive than what was required to provide okay-voice and SMS. Most of the emerging growth markets have no significant fixed (broadband data) infrastructure and in addition poor media distribution infrastructure which can relieve the mobile data networks being built. Huge rural populations with little available ARPU potential but a huge appetite to get connected to internet and media will further stress the mobile business models cost structure and sustainable profitability. This argument is best illustrated by comparing the household digital ecosystem evolution (or revolution) in Western Europe with the projected evolution of Emerging Growth Markets. The comprehensive dataset from Bank of America Merrill Lynch Global Wireless Matrix allows us to estimate what I have chosen to call a Market Profit Sustainability Risk Index. This Index provides a measure for the direction (i.e., growth rates) of Revenue & Opex and thus for the Profitability. Very High Risk (index –5): (i.e., for margin decline): (i) Compounded Annual Growth Rate (CAGR) between 2007 and 2013 of Opex was higher than equivalent for Revenue AND (ii) Year-on-Year (YoY) Growth Rate 2012 to 2013 of Opex higher than that of Revenue AND (iii) Opex Year-on-Year 2012 to 2013 Growth Rate is higher than the Opex CAGR over the period 2007 to 2013. High Risk (index –3): Same as above Very High Risk with condition (iii) removed OR YoY Revenue Growth 2012 to 2013 lower than the corresponding Opex Growth. Medium Risk (index –2): CAGR of Revenue lower than CAGR of Opex but last year (i.e., 2012 t0 2013) growth rate of Revenue higher than that of Opex. Low Risk (index 1): (i) CAGR of Revenue higher than CAGR of Opex AND (ii) YoY Revenue Growth higher than Opex Growth but lower than the inflation of the previous year. Very Low Risk (index 3): Same as above Low Risk with YoY Revenue Growth Rate required to be higher than the Opex Growth with at least the previous year’s inflation rate. The Outlook for Mature Markets are fairly positive as most of those Market have engaged in structural cost control and management for the last 7 to 8 years. 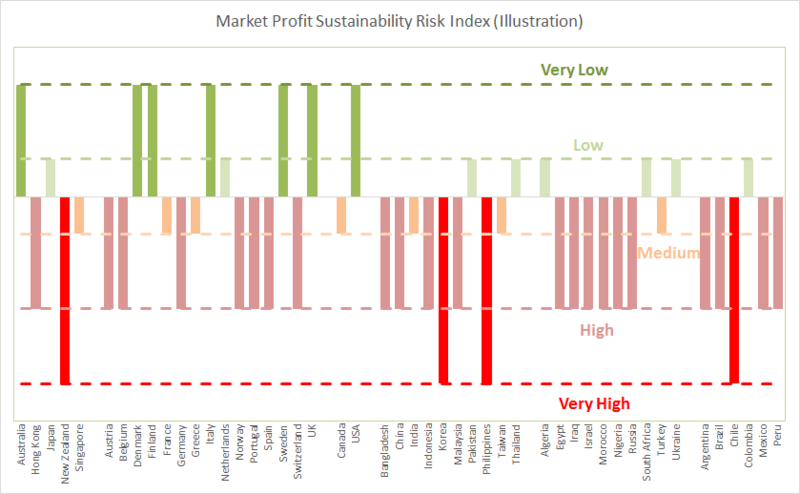 Emerging Growth Markets Profit Sustainability Risk Index are cause for concern. As the mobile markets are saturating it usually results in lower ARPU and higher cost to reach the remaining parts of the population (often “encouraged” by regulation). Most Emerging Growth markets have started to introduce mobile data, which is likely to result in higher cost-structure pressure & with traditional revenue streams under pressure (if history of Mature Markets are to repeat itself in emerging growth markets). The Emerging Growth Markets have had little incentive (in the past) to focus on cost structure control and management, due to the exceedingly high margins that they historically could present with their legacy mobile services (i.e., Voice & SMS) and relative light networks (as always in comparison to Mature Markets). Furthermore, it would be wrong to apply the Market Profit Sustainability Risk Index to individual mobile operators in the relevant markets analyzed here. The profitability dynamics of individual mobile operators are a wee bit more complicated, albeit some guidelines and predictive trends for their profitability dynamics in terms of Revenue and Opex can be defined. This will all be revealed in the following Section. Operator Profitability – the Profitability Math. with E, R and O being EBITDA, REVENUE and OPEX respectively. being valid for with being the margin and the subscriber market share can be found between 0% to 100%. The rest will follow in more details below, suffice to say that as the subscriber market share increases the Margin (or relative profitability) increases as well although not linearly (if anyone would have expected that ). Before we get down and dirty on the math lets discuss Operator Profitability from a higher level and in terms of such an operators subscriber market share (i.e., typically measured in subscriptions rather than individual users). In the following I will show some Individual Operator examples of EBITDA Margin dynamics from Mature Markets limited to Western Europe. Obviously the analysis and approach is not limited emerging markets and can (have been) directly extended to Emerging Growth Markets or any mobile market for that matter. Again BoAML Global Matrix provides a very rich data set for applying the approach described in this Blog. It has been well established (i.e., by un-accountable and/or un-countable Consultants & Advisors) that an Operator’s Margin correlates reasonably well with its Subscriber Market Share as the Chart below illustrates very well. In addition the Chart below also includes the T-Mobile Netherlands profitability journey from 2002 to 2006 up to the point where Deutsche Telekom looked into acquiring Orange Netherlands. An event that took place in the Summer of 2007. I do love the above Chart (i.e., must be the physicist in me?) as it shows that such a richness in business dynamics all boiled down to two main driver, i.e., Margin & Subscriber Market Shared. So how can an Operator strategize to improve its profitability? Here is how we can think about it in terms of Subscriber Market Share and EBITDA as depicted by the above Chart. 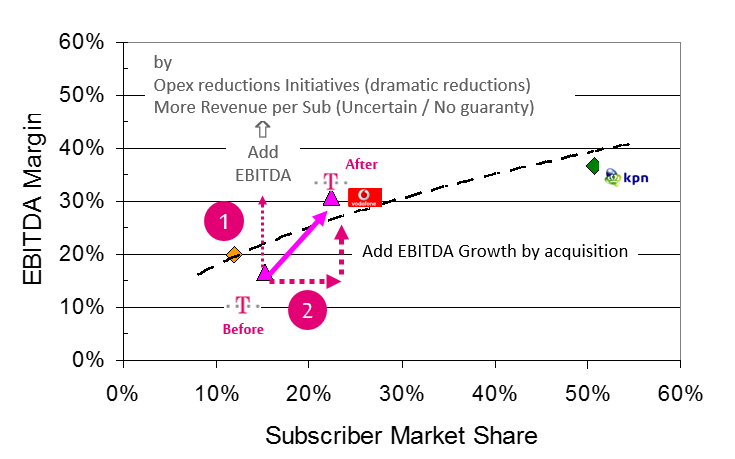 In simple terms an Operator have a combination of two choices (Bullet 1 in above Chart) Improve its profitability through Opex reductions and making its operation more efficient without much additional growth (i.e., also resulting in little subscriber acquisition cost), it can improve its ARPU profile by increasing its revenue per subscriber (smiling a bit cynical here while writing this) again without adding much in additional market share. The first part of Bullet 1 has been pretty much business as usual in Western Europe since 2004 at least (unfortunately very few examples of the 2nd part of Bullet 1) and (Bullet 2 in above Chart) The above “Margin vs. 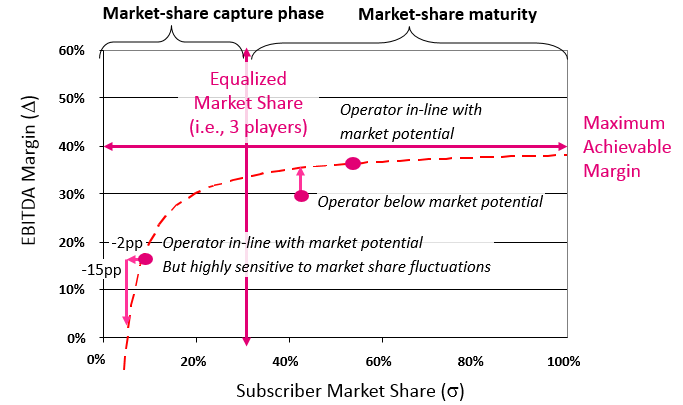 Subscriber Market Share” Chart indicates that if you can acquire the customers of another company (i.e., via Acquisition & Merger) it should be possible to quantum leap your market share while increasing the efficiencies of the operation by scale effects. In the above Example Chart our Hero has ca. 15% Customer Market Share and the Hero’s target ca. 10%. Thus after an acquisition our Hero would expect to get ca. 25% (if they play it well enough). Similarly we would expect a boost in profitability and hope for at least 38% if our Hero has 18% margin and our Target has 20%. Maybe even better as the scale should improve this further. Obviously, this kind of “math” assumes that our Hero and Target can work in isolation from the rest of the market and that no competitive forces would be at play to disrupt the well thought through plan (or that nothing otherwise disruptive happens in parallel with the merger of the two businesses). Of course such a venture comes with a price tag (i.e., the acquisition price) that needs to be factored into the overall economics of acquiring customers. As said most (Western) Operators are in a perpetual state of managing & controlling cost to maintain their Margin, protect and/or improve their EBITDA. 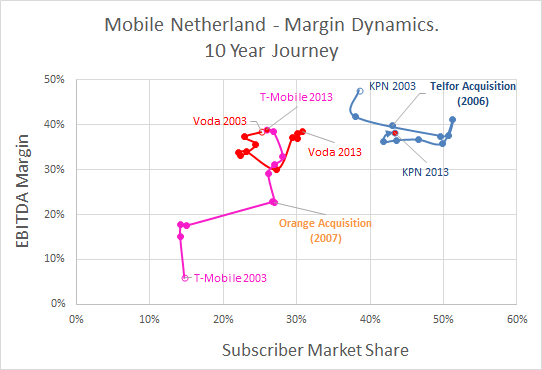 From both KPN’s acquisition of Telfort as well as the acquisition & merger of Orange by T-Mobile above Margin vs. 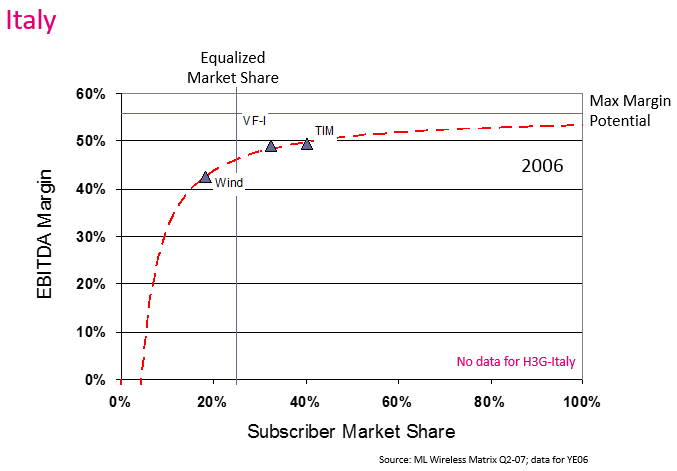 Subscriber Market Share Chart, we see that in general, the Market Share logic works. On the other hand the management of the integration of the business would have been fairly unlucky for that to be right. When it comes to the EBITDA logic it does look a little less obvious. KPN clearly got unlucky (if un-luck has something to do with it?) as their margin decline with a small uplift albeit still lower than where they started pre-acquisition. KPN should have expected a margin lift to 50+%. That did not happen to KPN – Telfort. 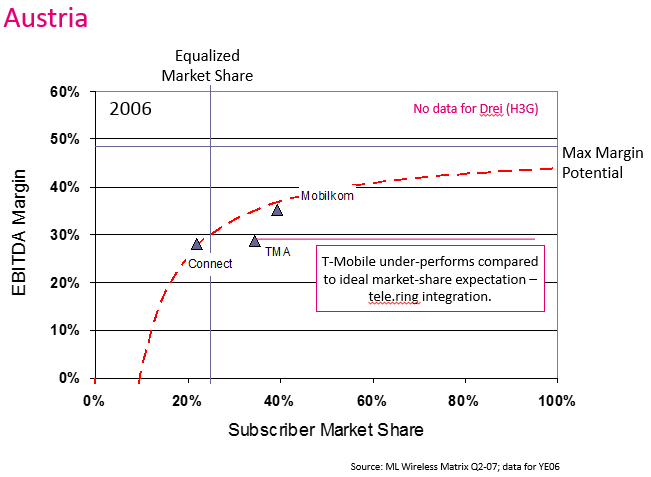 T-Mobile did fare better although we do observe a margin uplift to around 30% that can be attributed to Opex synergies resulting from the integration of the two businesses. However, it has taken many Opex efficiency rounds to get the Margin up to 38% that was the original target for the T-Mobile – Orange transaction. 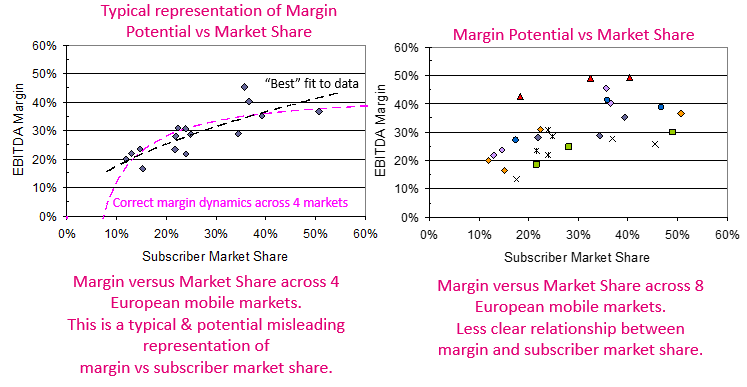 In the past it was customary to take lots of operators from many countries, plot their margin versus subscriber markets share, draw a straight line through the data points and conclude that the margin potential is directly related to the Subscriber Market Share. This idea is depicted by the Left Side Chart and the Straight line “Best” Fit to data. Lets just terminate that idea … it is wrong and does not reflect the right margin dynamics as a function of the subscriber markets share. Furthermore, the margin dynamics is not a straight-line function of the subscriber market share but rather asymptotic falling off towards minus infinity, i.e., when the company have no subscribers and no revenue but non-zero cost. We also observed a diminishing return on additional market share in the sense that as more market share is gained smaller and smaller incremental margins are gained. 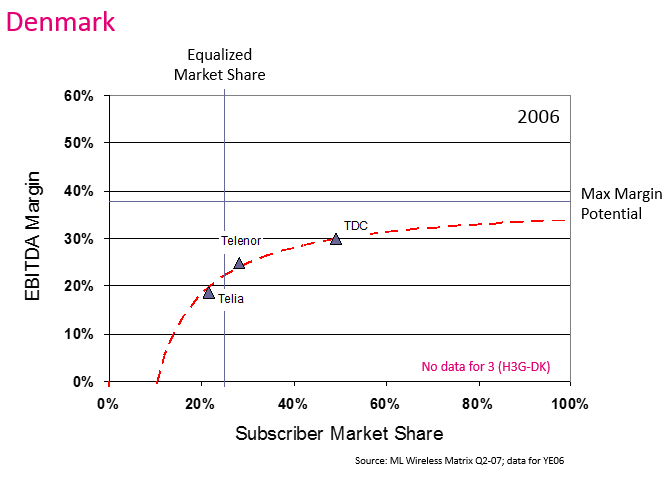 The magenta dashed line in the Left Chart below illustrates how one should expect the Margin to behave as a function of Subscriber market share. The Right Chart above shows has broken down the data points in country by country. It is obvious that different countries have different margin versus market share behavior and that drawing a curve through all of those might be a bit naïve. The Margin is not a linear function of the Subscriber Market Share (if anybody would have expected that) but relates to the Inverse of Market Share. Still the Margin becomes larger as the market share grows with maximum achievable margin of as the market share equals 1 (i.e., Monopoly). We observe that even in a Monopoly there is a limit to how profitable such a business can be. It should be noted that this is not a constant but a function of how operationally efficient a given operator is as well as its market conditions. Furthermore, as the market share reduces towards zero . Coverage strategy, i.e., to what extend the country’s surface area will be covered, network sharing, national roaming vs. rural coverage, leased bandwidth, etc.. Spectrum portfolio, i.e, lower frequencies are more economical than higher frequencies for surface area coverage but will in general have less bandwidth available (i.e., driving up the number of sites in capacity limited scenarios). Only real exception to bandwidth limitations of low frequency spectrum would be the APT700 band (though would “force” an operator to deploy LTE which might not be timed right given specifics of the market). General economical trends, lease/rental cost, inflation, salary levels, etc..
Market Invest (i.e., Subscriber Acquisition Cost SAC, Subscriber Retention Cost SRC), handset subsidies, usage-related cost, etc..
Any other variable cost directly associated with the customer (e.g., customer facing functions in the operator organization). This behavior is exactly what we observe in the presented Margin vs. Subscriber Market Share data and also explains why the data needs to be treated on a country by country basis. It is worthwhile to note that after the higher the market share the less incremental margin gain should be expected for additional market share. The above presented profitability framework can be used to test whether a given mobile operator is market & operationally efficient compared to its peers. What we first notice is that operators in the initial phase of what you might define as the “Market-share Capture Phase” are extremely sensitive to setbacks. A small loss of subscriber market share (i.e. 2%) can tumble the operator back into the abyss (i.e, 15% Margin setback) and wreck havoc to the business model. The profitability logic also illustrates that once an operator has reached Market-share maturity adding new subscribers is less valuable than to keep them. Even big market share addition will only result in little additional profitability (i.e., the law of diminishing returns). 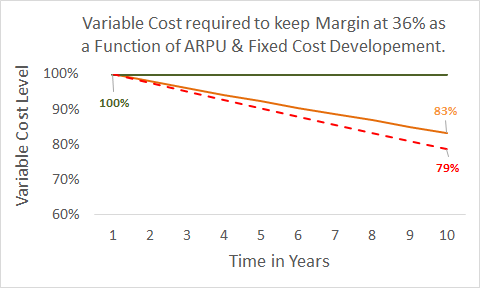 Above chart illustrates Margin as a function of ARPU & Cost (fixed & variable) Development at a fixed market share here chosen to be 33%. The starting point is an ARPU ru of EUR25.8 per month, a variable cost per user ou assumed to be EUR15 and a fixed cost per total mobile user market (of) of EUR0.5. 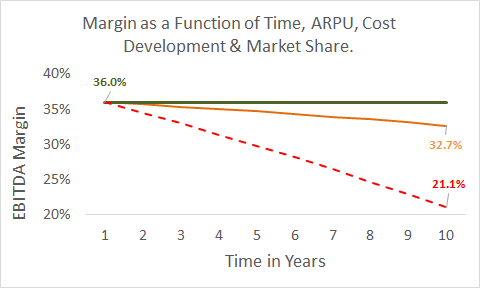 The first scenario (a Orange Solid Line) with an end of period margin of 32.7% assumes that ARPU reduces with 2% per anno, that the variable cost can be controlled and likewise will reduce with 2% pa. Variable cost is here assumed to increase with 3% on an annual basis. During the 10 year period it is assumed that the Operators market share remains at 33%. The second scenario (b Red Dashed Line) is essential same as (a) with the only difference that the variable cost remains at the initial level of EUR15 and will not change over time. This scenario ends at 21.1% after 10 Years. In principle it shows that Mobile Operators will not have a choice on reducing their variable cost as ARPU declines (again the trade-off between certainty of cost and risk/uncertainty of revenue). In fact the most successful mature mobile operators are spending a lot of efforts to manage & control their cost to keep their margin even if ARPU & Revenues decline. 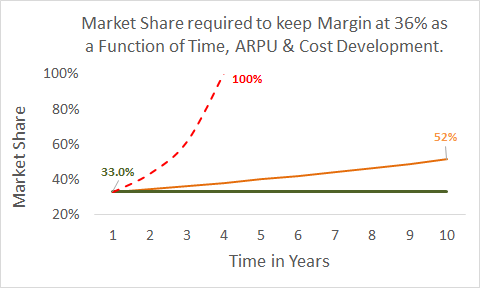 The above chart illustrates what market share is required to keep the margin at 36% when ARPU reduces with 2% pa, fixed cost increases with 3% pa and the variable cost either (a Orange Solid Line) can be reduced with 2% in line with the ARPU decline or (b Red Solid Line) remains fixed at the initial level. In scenario (a) the mobile operator would need to grow its market share to 52% to main its margin at 36%. This will obviously be very challenging as this would be on the expense of other operators in this market (here assume to be 3). Scenario (b) is extremely dramatic and in my opinion mission impossible as it requires a complete 100% market dominance. Above Chart illustrates how we need to manage & control my variable cost compared to the –2% decline pa in order to keep the Margin constant at 36% assuming that the Operator Subscriber Market Share remains at 33% over the period. The Orange Solid Line in the Chart shows the –2% variable cost decline pa and the Red Dashed Line the variable cost requirement to keep the margin at 36%. The following illustrates the Profitability Framework as described above applied to a few Western European Markets. As this only serves as an illustration I have chosen to show older data (i..e, 2006). It is however very easy to apply the methodology to any country and the BoAML Global Wireless Matrix with its richness in data can serve as an excellent source for such analysis. Needless to say the methodology can be extended to assess an operators profitability sensitivity to market share and market dynamics in general. The Charts below shows the Equalized Market Share which simply means the fair market share of operators, i.e., if I have 3 operators the fair or equalized market share would 1/3 (33.3%), in case of 4 operators it should be 25% and so forth, I am also depicting what I call the Max Margin Potential this is simply the Margin potential at 100% Market Share at a given set of ARPU (ru), AOPU (ou) and Fixed Cost (of) Level in relation to the total market. 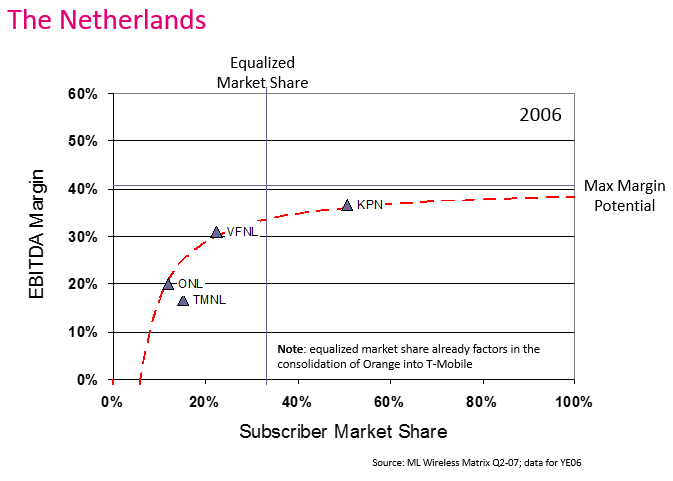 Netherlands Chart: Equalized Market Share assumes Orange has been consolidated with T-Mobile Netherlands. The analysis would indicate that no more than ca. 40% Margin should be expected in The Netherlands for any of the 4 Mobile Operators. 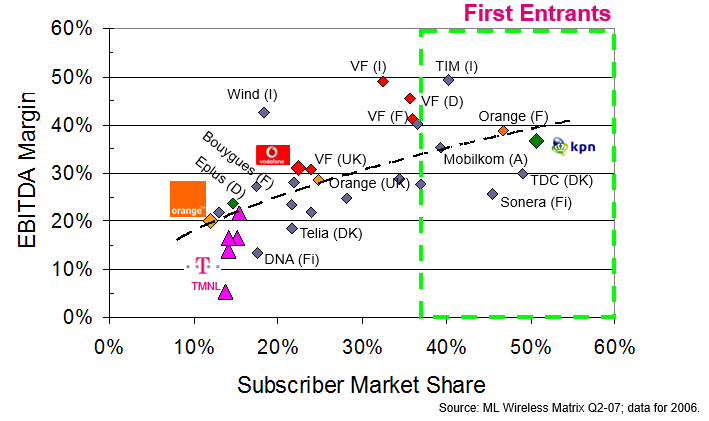 Note that for T-Mobile and Orange small increases in market share should in theory lead to larger margins, while KPN’s margin would be pretty much un-affected by additional market share. 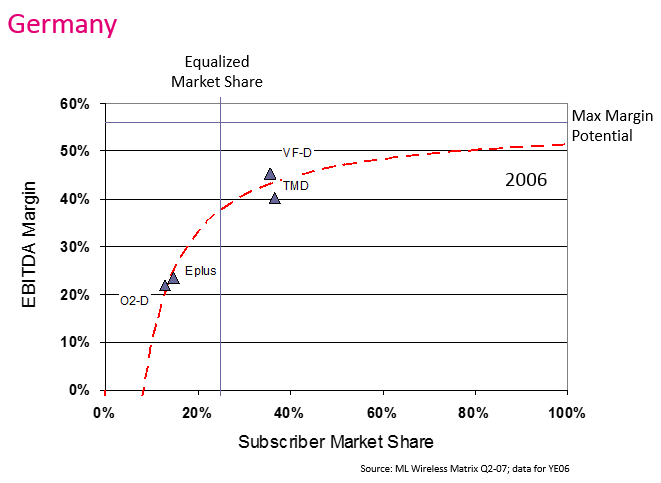 Germany Chart: Shows Vodafone to slightly higher and T-Mobile Deutschland slight lower in Margin than the idealized Margin versus Subscriber Market share. At the time T-Mobile had almost exclusive leased lines and outsourced their site infrastructure while Vodafone had almost exclusively Microwaves and owned its own site infrastructure. The two new comers to the German market (E-Plus and Telefonica-O2) is trailing on the left side of the Equalized Market Share. At this point in time should Telefonica and E-Plus have merged one would have expected them eventually (post-integration) to exceed a margin of 40%. Such a scenario would lead to an almost equilibrium market situation with remaining 3 operators having similar market shares and margins. I greatly acknowledge my wife Eva Varadi for her support, patience and understanding during the creative process of creating this Blog. I certainly have not always been very present during the analysis and writing.